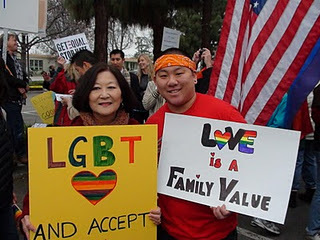 As we approach a week that celebrates straight allies, I look back in amazement at the road this reserved Asian-American mother has traveled to become an advocate for the lesbian, gay, bisexual and transgender (LGBT) community. I have two sons -- one whom doctors identified as male when he was born, and another whom doctors identified as female when he was born. For most of my children's lives, I believed I had a son and a daughter. Then, almost three years ago, my son Aiden, whom I saw as my daughter for the first 20 years, sat across from me at a restaurant table and bravely spoke the words that would begin our journey. With fear in his eyes and a tremble in his voice, he told me he was a transgender man and asked me to stand by his side as he transitioned from female to male. Although I feared what the future would hold for our family, I also knew that I loved my child with all my heart. So, not knowing what or how, only why, I took his hand and stepped onto an unfamiliar path, first as a mother and then as an ally. Over time, this Japanese-American mother, who never wanted to offend anyone, began to speak out, not only for her son, but for all the LGBT individuals who face discrimination and harassment for something that is no more a choice than the color of their eyes or hair. In reality, my journey had begun many years before, as my child's gender identity presented itself to me at a very early age. A tomboy from 3 years old, Aiden rejected dolls, dresses and the color pink loudly and vehemently. In first grade, I thought that Aiden might be traveling a different path, when the child I saw as my daughter came home and announced that he was in love with a girl. At that time I thought, "Isn't it unusual that at such an innocent age, my daughter is professing her love for someone of the same gender?" But I cast it aside, thinking it was just a way of admiring a classmate. In middle school, Aiden struggled to find a place to belong. No longer welcomed in boy circles as a tomboy, and no longer understood in girl circles, because he didn't like boys or makeup, I saw Aiden begin a downward spiral of withdrawal and sadness. His self-esteem, once high, plummeted. I watched as my child was thrown into complete internal chaos, unable to reconcile his innermost thoughts with the physical body he felt cursed with. Aiden withdrew into a more private world of pain and secrecy as he learned that our church, and society, wouldn't accept him. In high school, bullying and harassment became almost a regular occurrence. Aiden -- seen as a girl by the outside world -- began to express his masculine gender identity more and more. The classrooms themselves seemed fairly safe, except for the occasional name-calling, but the hallways between passing periods became a gauntlet of whispers, stares or outright harassment. Then physical violence entered our lives. The years of torment and judgment became too much for Aiden to bear. Diagnosed as agoraphobic (unable to feel safe in the world) with panic attacks, he barely graduated, suffering from depression, isolation and a sense of hopelessness. Years later, I would discover that these times held thoughts of suicide. Today, after transitioning to be the man he was meant to be, Aiden has blossomed into a spokesperson and advocate for the LGBT community. He believes that his dark days, as well as all the wonderful days that followed his transition, have transformed him into a more confident and caring human being. He does not focus on the darkness of his past life but has used his experiences to bring out the strength, courage and compassion in his heart. And so as we honor straight allies this week, I would like to express my sincerest gratitude to each and every ally who boldly speaks out against discrimination and injustice, supporting those in the LGBT community who only strive to live a life where they can be true to themselves and respected for that truth. The greatest allies of all are the parents and loved ones of people in the LGBT community who accept, support and love their LGBT children, friends and family members. I began this journey because I love my son and want him to live in a safer, more peaceful world. Each straight ally who speaks of love and acceptance gives me hope that we are moving closer to that dream.